Customs mounted inspectors and their supervisors in El Paso, Tex., circa 1887-1889. Seated at the right is Milton, wearing his Customs badge, before joining Immigration as the first Border Patrolman. 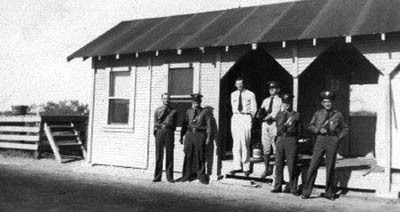 U.S. Border Patrol station located in Falfurrias, Tex., circa 1939. Pictured here are four Border Patrol inspectors (dark uniforms) and two Plant Protection and Quarantine officers from APHIS (light uniforms). Jeff Milton, a former Customs Inspector, was a one-man "line rider", known as the first Immigration Border Patrolman. Immigration has been the forgotten stepchild of the second era of globalization. The United States over the past half century con- sciously and deliberately freed up trade in goods, lifted controls on capital and investment, and urged and pressured other countries to do the same. Its immigration policy, however—the third leg of freer movement of people to accompany the freer movement of goods and capital—developed largely by accident. Legal immigration levels rose sharply beginning in the late 1970s, largely as an unanticipated consequence of the Immigration and Nationality Act of 1965 that allowed permanent residents and naturalized citizens to petition for family members to join them. The Immigration Act of 1990 added larger quotas as well for skilled immigrants with no family ties. The United States also tacitly accepted high levels of illegal immigration, whether Mexicans and Central Americans coming across the south- west land border or Chinese, Pakistanis, and Filipinos arriving by air and overstaying tourist or student visas. While there was constant grumbling about the problem of unauthorized immigration, espe- cially from the border states, the pressure to do something about the problem was outweighed by economic interests that opposed the sort of the heavy-handed government intervention that would be required to gain greater control. The landmark 1986 Immigration Reform and Control Act (IRCA), which continues to loom over the immigration debate today, coupled legalization for nearly 3 million unauthorized immigrants with a largely unmet promise of better bor- der security and workplace enforcement to discourage additional illegal immigration. CUSTOMS TODAY was the official U.S. Customs Service publication from 1956 until the establishment of U.S. Customs and Border Protection in 2003. Alone. In the dark. A brilliant night sky overhead and the desert heat your only companions. A sound breaks the silence - a twig snaps; there's a subtle rustle. Something is out there. Maybe it's just an animal wandering the desolate land. Heart pounding in anticipation of the unknown. Jeff Milton, a Texas Ranger and the first Immigration Border Patrolman lived this scene everyday during the 1880s, and he did it mounted on horseback with a revolver in his belt. Milton's job description sounds a lot like the one our Border Patrol agents have today - keeping out thieves, drug smugglers, and illegal immigrants and doing it in a dangerous and inhospitable environment. During our nation's infancy, there was little concern for controlling our borders. But around 1885, Congress started passing laws limiting immigration. To protect our labor market from the Chinese and other groups of cheap labor, Congress slowed the flood of immigrants to a trickle. The increasingly restrictive laws prompted a growing number of migrants to attempt illegal entry, creating the need for an official border-control presence. As early as 1904, the U.S. Immigration Service assigned a token force of mounted inspectors to patrol the border to prevent illegal crossings. The officers were untrained and few in numbers, and authorities were unable to stem the tide of illegal aliens crossing U.S. borders. In March 1915, Congress authorized a separate group of inspectors called mounted guards or mounted inspectors who operated from El Paso, Tex. These guards, who never numbered more than 75, rode on horseback and patrolled as far west as California. The focus of these inspectors were Chinese immigrants trying to avoid the Chinese exclusion laws. A number of factors fueled the need for tighter border security and increased patrol efforts, primarily the Immigration Act of 1917, which placed a head tax of eight dollars on each immigrant and required them to pass a literacy test. Prior to its passage, Mexicans and Canadians could cross at will without restrictions. Troops stationed along the border during the Mexican Revolution and World War I (1910-20) also greatly reduced illegal border activity, but after the war, with the soldiers gone, illegal immigrant crossings accelerated. Want to get into the country illegally? Why would anyone risk crossing at a port of entry when, north or south, between ports of entry, there were broad expanses of unguarded border? The European and Chinese migrants who poured into the country from Canada, Mexico, and Cuba took advantage of the relative ease of crossing the border where there were no stations, and the border was sparsely patrolled. A comprehensive plan that addressed the border vulnerability was needed to close and secure our borders against illegal entry. Prohibition began on January 16, 1920, when Congress passed the Eighteenth Amendment to the United States Constitution, prohibiting the importation, transport, manufacture, or sale of alcoholic beverages. Black market trade in "hooch" or illegal, often homemade, liquor demanded most of the attention of the border patrol effort. Officers patrolled the Canadian border to stem the liquor traffic between "wet" Canada and the "dry" United States. But the northern border did not have a monopoly on liquor smuggling - whiskey bootleggers operated along the Mexican border, avoiding the bridges and slipping their forbidden cargo across the Rio Grande by way of pack mules. New quotas placed on immigration to the United States by the Immigration Acts of 1921 and 1924 also fueled illegal entry. Congress was growing concerned that there would be an uncontrolled flood of immigration from the war-ravaged countries of Europe. A force that could devote its energy to prevent smuggling, illegal entry, and subsequently arrest illegal entrants into the country would make our borders more secure. On May 28, 1924, Congress established the United States Border Patrol as part of the Immigration Bureau, an arm of the Department of Labor. In 1925, their patrol areas were expanded to include over 2,000 miles of seacoast extending along the Gulf and Florida coasts. The Patrol recruited many of the early force of 450 officers from the Texas Rangers and local sheriffs and their deputies - men who knew the land and the dangers it presented. Appointees from the Civil Service Register of Railroad Mail Clerks supplemented the rough and ready crew. The U.S. government initially provided the border patrol agents a badge, revolver, and an annual salary of $1,680. Recruits furnished their own horse and saddle, but Washington, D.C., supplied oats and hay for the horses. This small group of officers was given the responsibility for enforcing Section 8 of the Immigration Act of February 5, 1917 (39 Stat. 874:8 U.S.C. ), which prohibited smuggling, harboring, concealing, or assisting a migrant not duly admitted by an immigration inspector or not lawfully entitled to enter or reside in the United States. Initially, the officers had nothing but their badges to distinguish them from other citizens. This situation gave smugglers and illegal migrants an excuse for ignoring their commands, posing a real danger to the officers. In December 1924, Congress authorized the purchase of uniforms. In 1932, the Border Patrol was placed under the authority of two directors, one in charge of the Mexican border office at El Paso, Tex., the other in charge of the Canadian border office at Detroit, Mich. The patrol recognized the need for formal training, and in December 1934, opened the first Border Patrol Academy at Camp Chigas in El Paso. Thirty-four trainees attended classes in marksmanship and horsemanship. Rugged terrain and the need for quick, quiet transportation guaranteed that horses would remain essential transportation to the Border Patrol even to the present day. During World War II the American public feared that aliens who would undermine the country's security would try and enter the United States. In response, the Border Patrol added 712 agents and 57 auxiliary personnel, bringing the force to 1,531 officers. During the war, the Border Patrol provided tighter control of the border, manned alien detention camps, guarded diplomats, and assisted the U.S. Coast Guard in searching for enemy spies. It was during the war that the Border Patrol began using aircraft with great success and their use became an integral part of operations. After the onset of World War II, farm laborers entered the military or found jobs in the expanding war industry, creating an acute labor shortage in agriculture. Food production was critical to winning the war, and alien labor was necessary to accomplish it. An agreement with Mexico, effective August 4, 1942, provided for the importation of Mexican nationals. The war ended, but the importation of alien labor did not. Over the course of the next fourteen years, the American agricultural industry imported Mexican laborers, some British West Indians, and a few Canadian woodsmen to this country under a variety of provisions. The numbers of illegal migrants entering the country was growing at an alarming rate, especially in the California and Rio Grande Valley areas along the Mexican border. Citizen groups alleged that these migrants were responsible for the growing violent crime rate and implored the Immigration Service to put a stop to their entry. The Patrol responded by moving resources - sixty-two Canadian border units were transferred south for a large-scale repatriation effort. In 1952, the government airlifted 52,000 illegal immigrants back to the Mexican interior. During the late 1950s, significant numbers of illegal migrants began entering the U.S. on private aircraft. In cooperation with other federal services, the Border Patrol began tracking suspect flights. During the early 1960s, aircraft hijacking attempts became the newest threat to our security. President John F. Kennedy ordered Border Patrol agents to accompany domestic flights to prevent takeovers by hijackers. By this time the business of alien smuggling began to involve drug smuggling. The Border Patrol began assisting other agencies in intercepting illegal drugs en route from Mexico. The 1980s and 1990s saw a tremendous increase of illegal migration to America. The Border Patrol responded with increases in manpower and the implementation of modern technology. Infrared night-vision scopes, seismic sensors, and a modern computer processing system helped the Border Patrol locate, apprehend, and process those crossing into the U.S. illegally. In an effort to bring a level of control to the border, Operation Hold the Line was established in 1993 in El Paso. Agents and technology were concentrated in specific areas, providing a "show of force" to deter illegal border crossings. The drastic reduction in apprehensions prompted the Border Patrol to expand the effort to San Diego, Calif., which accounted for more than half of illegal entries. Operation Gatekeeper was implemented in 1994, and reduced illegal entries in San Diego by more than 75 percent over the next few years. New dangers confront our nation's borders. As part of Customs and Border Protection, the Border Patrol is taking on the additional challenge of protecting our borders against terrorism. History has shown that it matters little whether the drug is alcohol or marijuana; the illegal migrants, Chinese or Mexican; or the terrorists, hijackers, or suicide bombers - in any scenario, we can count on the Border Patrol to protect us from threats to the safety and security of our borders. History repeats itselfJefferson Davis Milton, was "the best six-shooter in the country" and for a time was the lone "line-watcher" patrolling the Southern border. Milton was born on November 7, 1861, near Marianna, La., on a plantation called "Sylvania." He was named for the President of the Confederacy who was a personal friend of his father, General John Milton, Civil War governor of Florida. At 16, he left home to go to the Southwest and work as a cowpuncher and at 18, he joined the Texas Rangers. During his three years as a Ranger, Milton acquired a reputation for speed and accuracy with a six-shooter. In 1884, he went to New Mexico as a cowboy detective for a cattle association. In the 1890s, he worked for the Southern Pacific Railroad and for the Pullman Company. By 1894, he became chief of police in El Paso, Tex., and in 1895, became the deputy U.S. Marshall. He worked as an express messenger for Wells Fargo (1895-1900). In 1887, he moved to Arizona and became an inspector with the United States Customs Service until 1889. In 1904, he joined the Immigration Service, then part of the Department of Commerce and Labor, as a "Mounted Chinese Inspector" guarding the border against the illegal entry of Chinese into the United States. However, Milton has always been known as the first Immigration Border Patrolman even though the Border Patrol was not officially organized until he had completed 20 years of service. He retired on June 30, 1932, at the age of 71. He died in Tucson, Ariz. on May 7, 1947. Jefferson Davis Milton, was "the best six-shooter in the country" and for a time was the lone "line-watcher" patrolling the Southern border.